A friend gave us an above ground 33' x 52" round pool. There are some parts missing, like 2 bottom bases. Can we turn this size pool into a 27' x 52" by decreasing it due to we are missing some parts and we can not find replacement parts anywhere. Hi Tina. You should be able to convert the pool. I usually recommend ordering a new set of bottom rails because the arc is slightly different between a 33' and a 27'. The difference is so small that you might be OK using the ones you have. You could start by laying out the bottom rails and start connecting them using a tape measure and setting the radius at 13' 6". Hopefully when you get back to the beginning you will meet up with an open footplate, and not in the middle of the beginning rail. It should work out that you wind up close to the 27' round mark by just removing a couple of rails. Most top rails are made with multiple hole sets for different size pools. If so you will just use a different set of holes. The arc will be different so the way the rails were set originally will not work, you will need to make an adjustment. Usually this adjustment is easy. If you get the pool set up to be as close to 27' as possible a standard liner should fit the pool just fine. I have a round 24ft above ground pool that I would like to make into an 18ft. is this possible.?? Hi In most cases this would be possible. You would need new 18' round bottom rails. Hi. We bought a nice four year old pool on craigslist, and were told it was a 24 foot one, which ended up being a 28 foot one which is way too big for our yard. Can we make it smaller to fit our space? We would like to make it an 18 foot one instead possibly even a 16 foot one. What are the steps to do this? I called pool places, which they said it was not possible to do that... what are your thoughts? We really want to keep it, and not have to sell it to look for a different one. Thanks! Is it possible by removing sections and cutting the wall to convert a 21 foot pool to an 18 foot? I know it's not the same radius but I calculated that if sections are about 48" long, a slight bend of 3/4" is required per section to get the radius of an 18 foot pool. Hi Tommy. What you are asking is very possible and I have done it many times. My method for shortening the wall is to overlap the starting point by about six inches. I then score the wall several times with a razor blade. Bending the wall back and forth a few times along the break line should snap it with a nice clean edge. I then use the existing bolt holes as a guide to drill my first set of holes. With that done I add a second row a few inches away from the first. I try to make sure both rows can be covered with the upright. With small uprights it's not always possible. If I were doing this to a Doughboy brand pool I would order the new bottom rails. Like you said, there is a difference in arc. Doughboy parts are easy to get, and very universal, so getting the right size bottom rails would not be a problem. There is only one brand of pool I have seen, in my 40 plus years of doing this, that did not use a different bottom rail for each size pool. There was a company that would use the same rail for the 15' and the 18', and then a different one for the 21' and the 24'. So I know what you say is possible. Most above ground pools use the same top rails for all of their round pools. They are stamped with different hole configurations, as are the upright top caps, so each size pool uses a different set of holes. If this is not the case with yours new holes will have to be made. Making new holes is pretty easy, the key is to make sure all of your uprights are straight up and down. Put a level on each one, set the rails in place and add new holes where needed. The one thing you do not want to do is to use a 21' liner in your new 18' pool. I'm kidding of course, but you never know, someone might just try doing it that way. Can you take a 24 ft. round pool and make it smaller in size by removing some panels? Hi Bob. It is possible to make a round pool smaller, but not quite as easy as you describe. Above ground pool walls are normally one piece, so there are not actually panels to remove. It's one continuous roll, but it can be cut down in size fairly easily. When I am installing the wall in the new sized framework I overlap the beginning by about six inches. I then score the wall several times with a razor knife. The wall can then be bent back and forth until it snaps. At the joint I normally just add a second row of nuts and bolts. That seems to be plenty of strength. I have never tried to fold over the ends and make hems on them, that seems like a lot of extra work. When you change the size of your pool the arc of the radius changes also. Most top rails are adjustable and can be used on 18', 21', 24' and 27' pools just by changing the location where you install the screws. If the rails do not have multiple hole options new holes will have to be made. The only parts that will not work are your bottom rails. You would need to get new ones for the size pool you are planning to build. The arc of the rails is very different between the sizes and just leaving a few out will not work. So, you will need to pick a common size, like an 18' or a 21', get new bottom rails, and the rest is pretty easy. 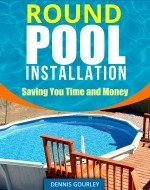 Can you convert a 21ft by 41ft oval pool to a 21ft round pool? Hi It sounds possible to me. We have the chance to get a free 30’ round pool but that would never fit in our back yard, is it possible to downsize that to a 24’? Hi It should be possible but would require some new parts. The arc of the bottom rails will be different so you will need new ones. You may also need new top retaining rods, depending on the pool. Most top rails will adjust to different size pools, but not all. It is easy to over lap a side wall by six inches, cut off the excess, and run a double set of nuts and bolts. You just need to make sure everything else will work.